The Mekong Lowlands region of Cambodia is located in the center of the country. It stretches from provinces such as Takeo and Svay Rieng in the South to Kompong Thom in the North. The region’s most famous landmark is Phnom Penh, the capital of Cambodia, which lies in the Southwest of the Mekong Lowlands. One of Phnom Penh’s most important cultural and historical landmarks is the Choeung Ek Genocidal Center, which lies about eight kilometers outside of the city. This marks the “killing fields”, where around 17,000 Cambodians were tragically murdered by the dictatorship government in the mid-1970s. Nearby, you’ll find the S21 Prison, which was built out of an old school building, and is where prisoners were kept before being massacred. The best way to explore both of these must-sees is with a pre-booked guided tour. Phnom Penh is Cambodia bustling capital, home to the Royal Palace. 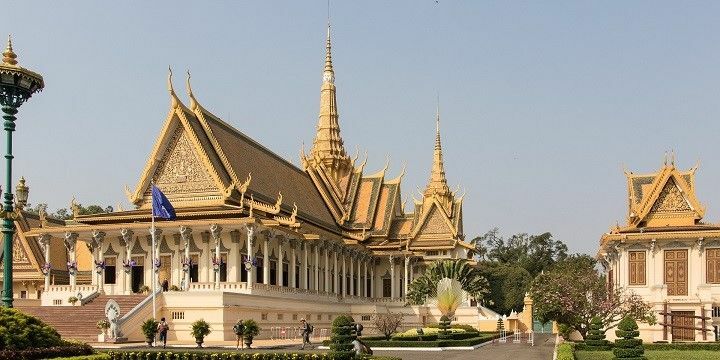 To learn more about Cambodian history, check out Phnom Penh’s Royal Palace, a complex of ornate buildings, which has housed the country’s royal family since the mid-1800s. Nearby, you’ll find the National Museum with a huge array of exhibitions on the country’s history. If you’re not too tired after exploring these landmarks, head to the Sisowath Quay district, where you can take a break in one of the area’s many bars and restaurants, that look over the idyllic Tonle Sap and Mekong rivers. The Mekong region offers plenty of alternatives to Cambodia’s most popular temple collection, Angkor Wat, located in the North of the country. While this certainly is a must-see, Mekong’s temples are much quieter, and equally as beautiful. In Kampong Thom, for example, you’ll find Sambor Prei Kuk. This collection of more than 100 temples is located in the middle of a beautiful forest and dates back to the seventh century. The city is also home to Phnom Santuk. On top of this 200-meter-high hill, which is surrounded by dense forest, you’ll find an ornate Buddhist temple, alongside shrines and statues of Buddha. You can reach the peak via 809 stairs, or by car or moped along a 2.5-kilometer paved road, if you’re feeling less energetic. Kampong Cham features several tombs. 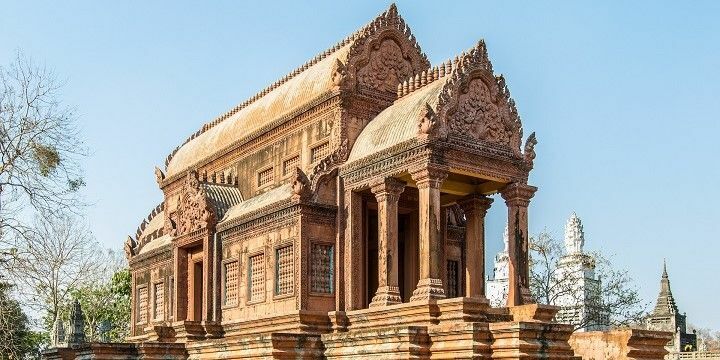 Meanwhile, Kampong Cham in eastern Mekong is home to the Nokor Bachey temples, which were built in the eleventh century. Some of the mausoleums still contain piles of bones from the genocides during Khmer Rouge’s reign. There’s plenty to do off the Mekong mainland. Koh Dach island, for example, is located just off the bank of the Mekong River in Phnom Penh. Here, you can see how silk is made from start to finish and get your hands on some beautiful and unique handmade silk items. Be sure to check out the island’s stunning beaches as well as the Koh Dach pagoda. If you’re in the East of Mekong, head to Koh Paen, another Mekong river island. It’s connected to the mainland via a bamboo bridge, which is taken down at the beginning of the rainy season, and rebuilt again by locals at the start of every dry season. Owing to its temporary nature, the bridge shakes as you pass over it, but it’s well worth the risk for the beauty that you’ll find on the island, including vast rice fields and farmlands. Lots of sightseeing opportunities, many temples, culture, and history.